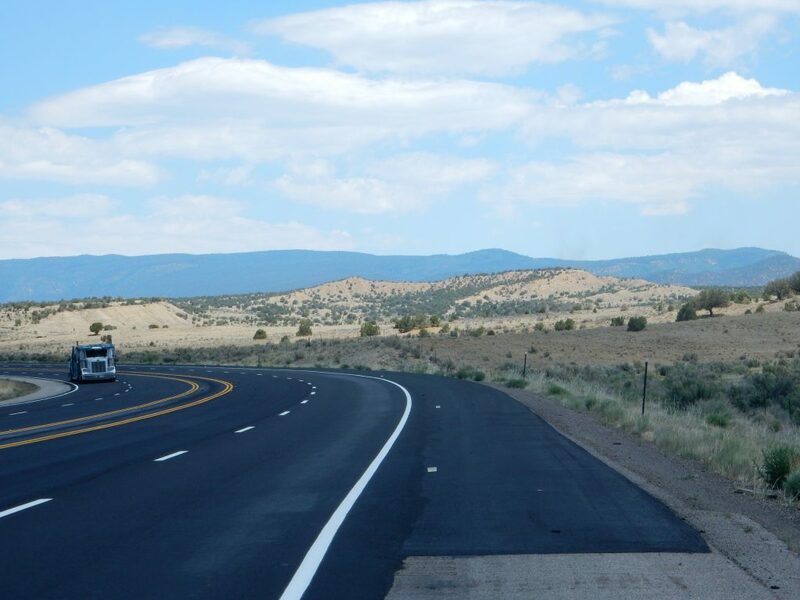 The small town in northern New Mexico, not the island nation. Though I’m guessing the island has some interesting geology. The choice of venue was dictated by three considerations. First, Gary is still tending to family business, so this would be a solo trip again. Second, Santa Fe National Forest is under Stage III fire restrictions, which amounts to the forest being completely shut down and off limits. Third, my realization that Shark Tooth Ridge is not actually underlain by Point Lookout Sandstone, but by the Gallup Sandstone, has prompted me to extensively rewrite the chapter on the Mesozoic in my latest draft of the book, and I realized I was pretty skimpy on the Cretaceous sections. There’s no better place to remedy that then a trip up the west side of the Sierra Nacimiento. So Friday morning I was up reasonably early, planning to take care of some business before heading out. I had decided that I couldn’t justify putting any more money into Clownie the Wonder Car; we have two drivers and three cars in our household, and I’d rather put the money into keeping the Wandermobile in good condition. So I had spread the word that I had a rather old car needing about $300 in repairs to render it mobile again, free to a good home, and I soon had a taker who needed to have me meet him at the local credit union to have the transfer documents notarized. The dramatic contact is between light tan beds of the Otowi Member, Bandelier Tuff, and red beds of the Meseta Blanca Formation, Yeso Group. The shape of the contact shows that this was a paleovalley. Let’s unpack that. The Meseta Blanca Formation, together with the San Ysidro Formation, make up the Yeso Group. These are rock beds that were laid down in the late Permian, around 280 million years ago. The Meseta Blanca Formation is thick sandstone beds, laid down by wind in a dune field. The younger San Ysidro Formation, which is missing here, was coastal sandstone. This was a time when New Mexico was low ground southwest of the Ancestral Rocky Mountains. These precursors of the modern Rockies were eroded flat during the Mesozoic, the age of the dinosaurs. Some time prior to 2 million years ago, these beds were uplifted as North America drifted onto the East Pacific Rise, a great upwelling in the earth’s mantle. Erosion exposed the beds and carved a shallow canyon here. 1.65 million years ago, the super-colossal* Toledo eruption in the central Jemez sent pyroclastic flows in all directions. These were clouds of volcanic ash mixed with red-hot gas that flowed across the ground for miles, destroying everything in their path. One such flow filled the paleocanyon here, then cooled and settled to the surface to form a thick bed of tuff, consolidated volcanic ash, assigned to the Otowi Member of the Bandelier Tuff. This was not actually what I had come out to see, but I love noticing something new in familiar territory. 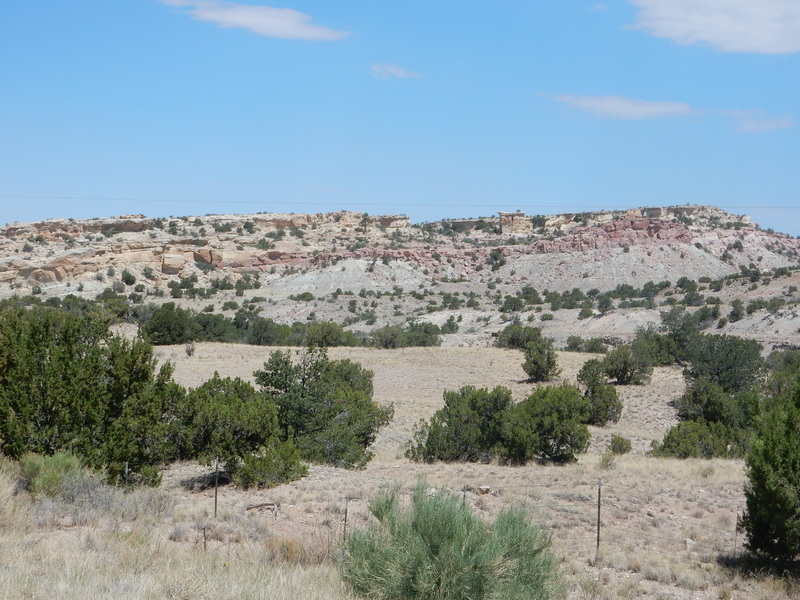 Near San Ysido, I decided conditions were perfect for a panorama of White Mesa, Mesa Cuchilla, and the southern Sierra Nacimiento. This image pans across the last 1.6 billion years of geologic history in this area. The high terrain on the skyline is all part of the Nacimiento Uplift, which includes the modern Sierra Nacimiento. This is a remarkably flat, regular block of crust that has been tilted up and to the east, revealing previously buried rock beds on either side. I will pass through this uplift east of San Ysidro and it will be to my right all the way to Cuba. 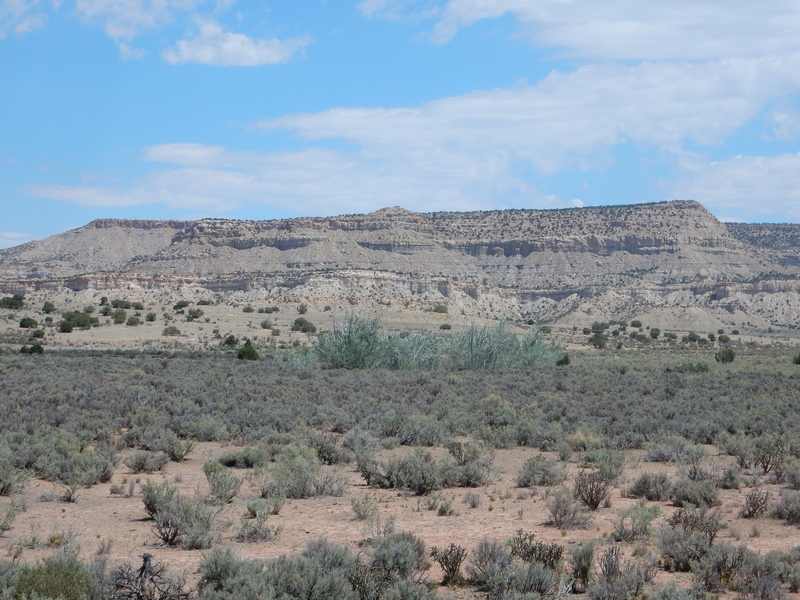 The youngest beds, apart from the geologically recent alluvium filling the valley, underly White Mesa to the left. 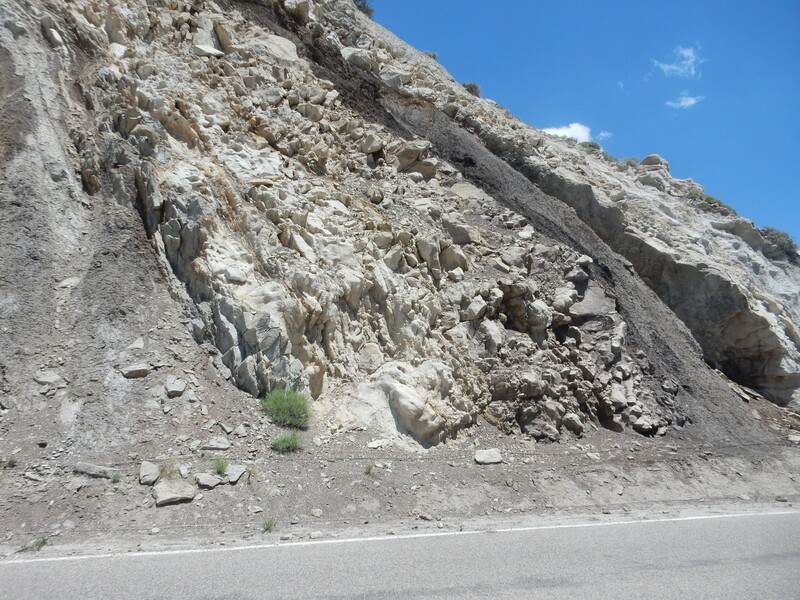 Here the southern “nose” of the uplift plunges under the surface, so that the uplift is least here and the older beds are still deep below the surface. The exposed beds are upper Triassic (about 230 million years in age) to Jurassic (about 160 million years ago). We’ll get a good look shortly. 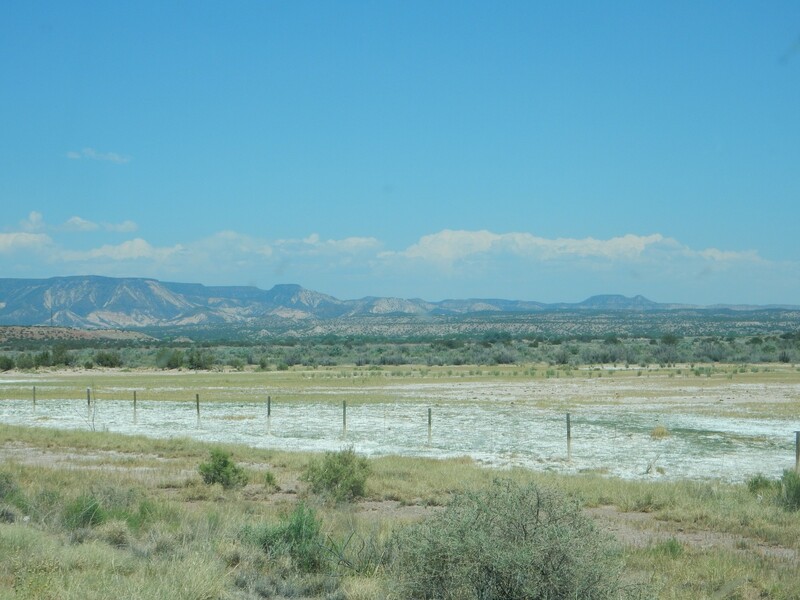 The gap between White Mesa and Mesa Chuchilla, almost in line with the village of San Ysidro, is the valley of the Rio Salado. This has been eroded in the rock beds corresponding to the Chinle Group, almost all of which are beds of very soft red sediments. These have been eroded away from the escarpment of White Mesa to the southern tip of Mesa Chuchilla, leaving the lowest member of the Chinle Group, the resistant Shinarump Formation, as a hard cap on Mesa Chuchilla. There seems to be a fairly sharp transition from dark red beds to lighter red beds about where the Abo should meet the Yeso. This puzzles me a bit; the Abo is usually the darker red formation. But formations can vary considerably in character from one location to another, something I’ll see many more examples of today. At right is Pajarito Peak, the high point of the southern Sierra Nacimiento. This is underlain by Precambrian quartize that is probably around 1.6 billion years old — the oldest rock I’ll see today. 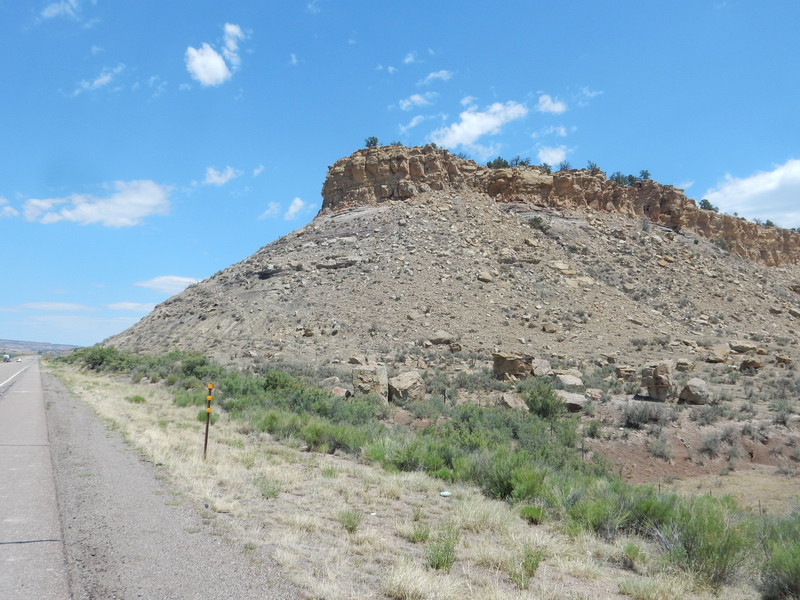 The mesa below and in front of Pajarito Peak seems to be identified as Hard Rock Ridge on my geologic map, which also shows it as capped by Shinarump Conglomerate. It is on the east side of the major fault I mentioned a moment ago, and has been thrown down hundreds of feet relative to the Shinarump beds capping Mesa Chuchilla. 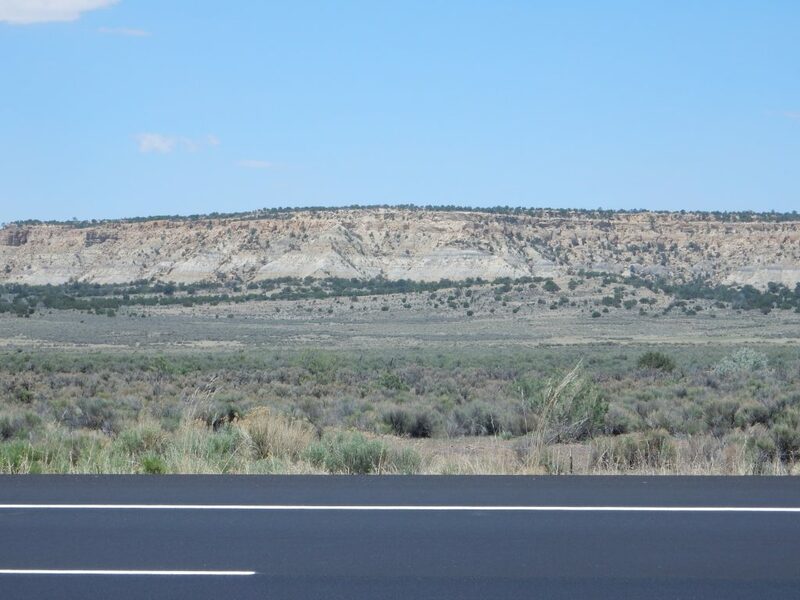 I did not notice at the time, but the small hill beside the road, from which I am taking photographs, looks suspiciously like the site of a ruined pueblo on the satellite photograph. I note that an acequia, irrigation ditch, jogs around it, though this could just be the terrain. I did not intend to disturb any ruins, nor did I have any idea any were here when I chose this spot to pull over and take pictures. Well, not every faint but suspiciously geometric pattern on the ground in the Jemez is an old ruin, though some certainly are. I didn’t plan to linger at White Mesa; I’ve been here before. But the light was particulary good for one exposure. The white cap is the Jurassic Todilto Formation, a bed of limestone and gypsum laid down around 160 million years ago in a shallow bay where seawater was trapped and concentrated in what must have been a very arid climate. Beneath is a thin layer of Entrada Formation, a sandstone formation that is also Jurassic in age. Beneath the sandstone are thick beds of poorly cemented red mudstone of the Petrified Forest Formation of the Chine Group. Like all members of the Chinle Group, these beds were laid down by the Chinle River — here, no longer young, but a sluggish, mighty river like the modern Mississippi, laying down thick mudstone in its valley and delta. The rich chocolate brown reminded me of the Moenkopi Formation, but these are apparently erosional remnants of the lowermost Petrified Forest Formation resting on Shinarump Conglomerate. I turn north around the southern end of Red Mesa. The white beds are Todilto Formation capped with the next youngest formation of the Jurassic, the Morrison Formation. Beyond, exposed on the side of the mesa, are the same much older Triassic and Permian beds we saw on the east side of Mesa Chuchilla. The Pajarito Fault lies along the western foot of Red Mesa and is part of the Nacimiento Fault Zone, a major structural feature of nothern New Mexico that runs north almost as straight as an arrow to beyond Cuba. 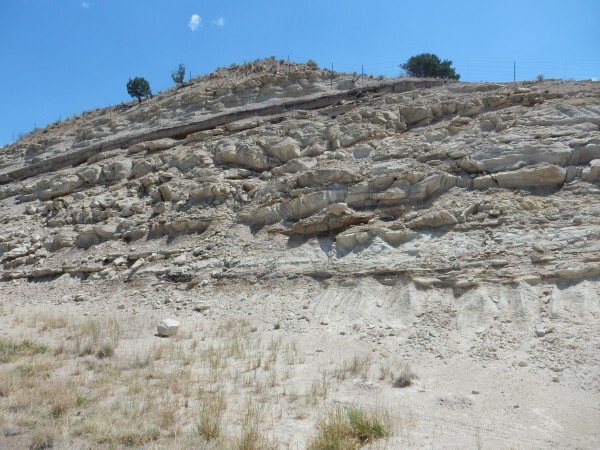 The fault has actually thrust the block of crust containing the Permian and Triassic beds over the younger Jurassic beds to the west, tilting and deforming the younger beds. 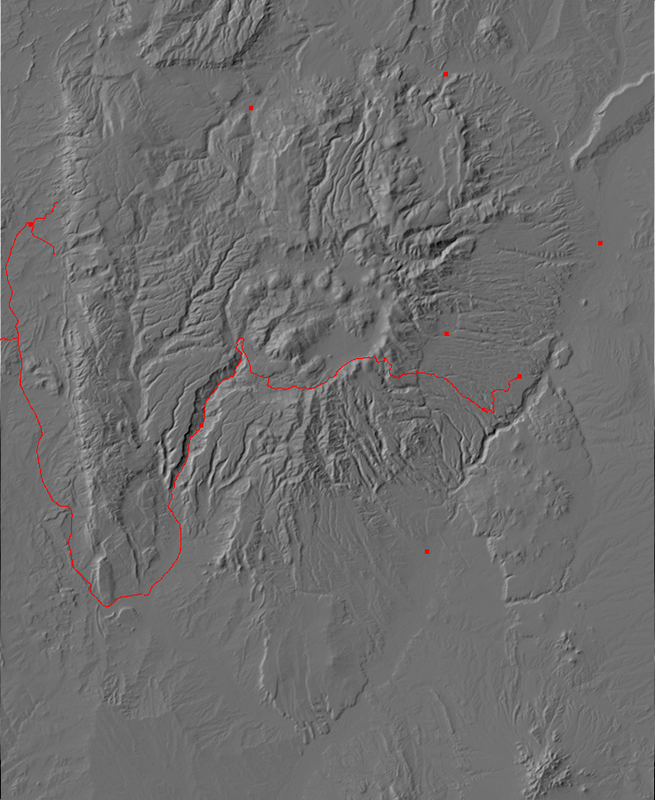 The lower red slopes of Red Mesa are mapped as Yeso Group. If I’m reading the map correctly, the lower double ledge above the red slope is Glorietta Sandstone; the notch is the more reasily eroded Moenkopi Formation, then Shinarump Formation caps the mesa. 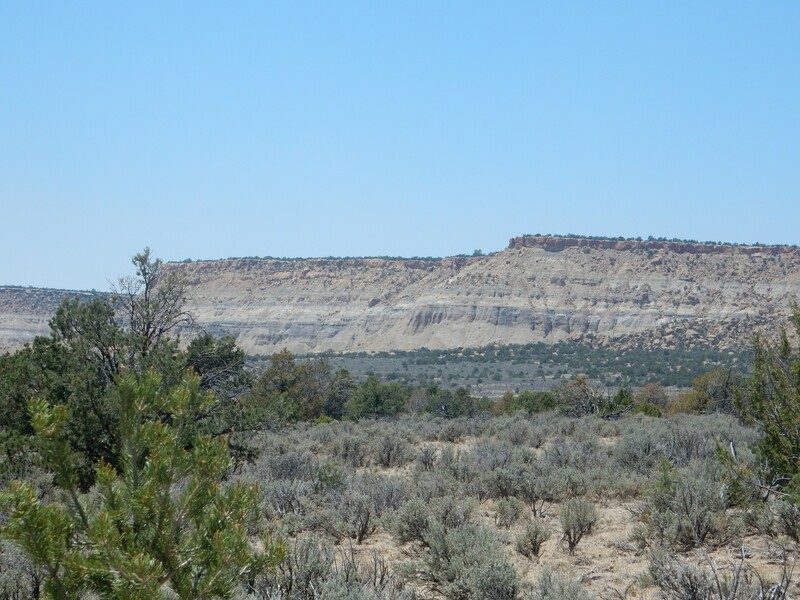 The latter is 80 million years older than the Morrison Formation beds on the other side of the fault at the base of the mesa to the west. 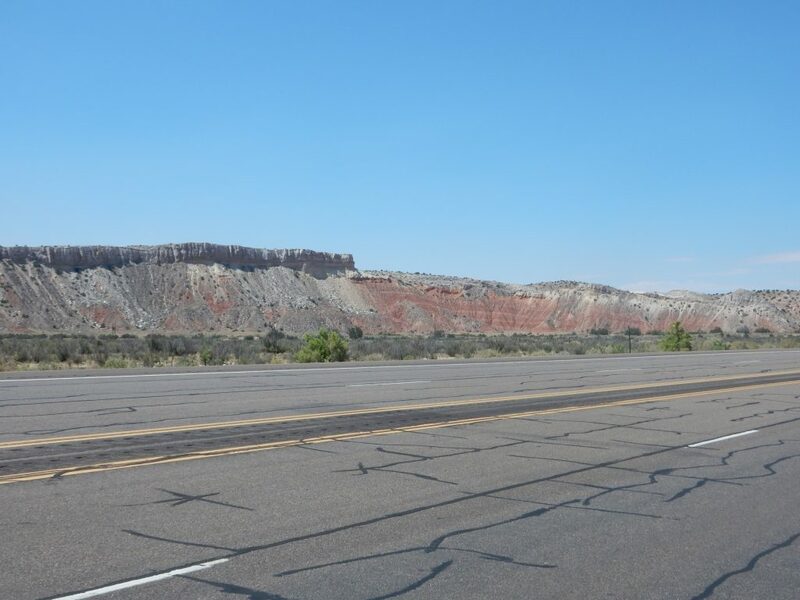 Further down the road, there is a thin but prominent sandstone bed capping the Chinle mudstone east of the highway. Further down the road, I see it dividing the slope below the Todilto cliffs. 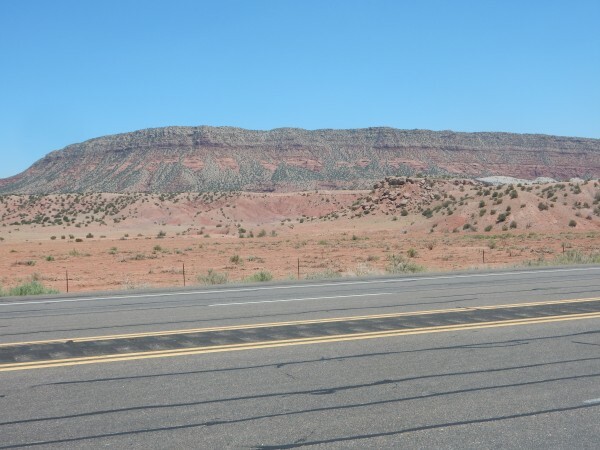 My thought at the time was that the Entrada was limited to the thin white layer just below the Todilto cap; the light reds below were equivalent to the Salitral Formation of the Chinle Group, the thin sandstone bed to the Poleo Formation, and the lower beds to the Petrified Forest Formation. 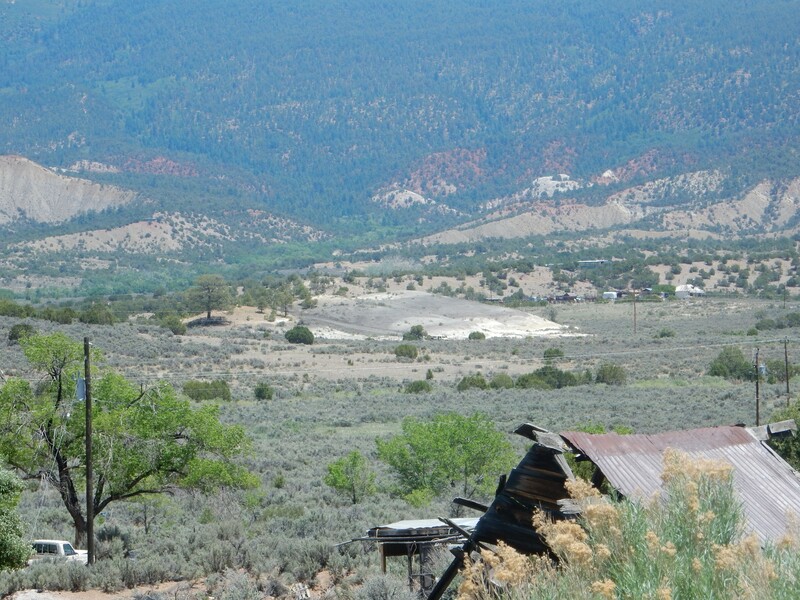 This is the sequence further north, at the Nacimiento Mine near Cuba and in the northern Jemez. But no. Consulting the map when I got home, and looking at other photographs I’ve taken in the area, I found that the entire pink slope between the Todilto and the thin sandstone bed is Entrada Sandstone, and everything below is mapped as Petrified Forest Formation. The bed apparently has no formal name, though it is a very useful marker bed in this area, showing the contact between two formations. This becomes clearer further north. Soon the highway cuts through the Todilto Formation, and we see the next formation. To the left is the upper surface of the Todilto. The geologic map maps everything visible beyond as Morrison Formation. Just a bit down the road, one gets a nice view down the unnamed arroyo to the west. 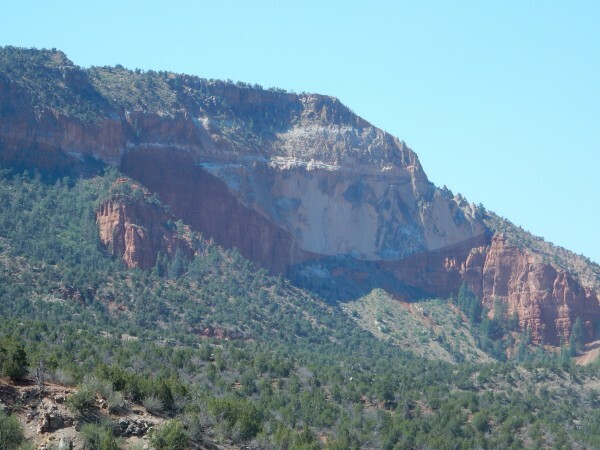 The pinkish slopes at bottom look a lot like Summerville Formation, which is found between the Todilto and Morrison in the northern Jemez; there is a tendency for geologists mapping south of the Jemez to assign beds resembling the Summerville Formation to the Tidwell Member of the Morrison Formation. (And I am not geologist enough to be entitled to an opinion who is right, though … this looks an awful lot like Summerville Formation to me.) The more resistant beds above seem to match the description of the Salt Wash Member, which in our area is mostly well-cemented sandstone. Above that are muddier beds likely of the Brushy Basin Member. Further along the road, the Brush Basin Member seems to be capped by more resistant beds. The lower greenish beds are typical of the Jackpile Member, which also contains some sandstone beds. That would be my tentative identification. Above the Morrison Formation — or, here, to the west, because of the way the beds are tilted against the Sierra Nacimiento — is the Mancos Shale. 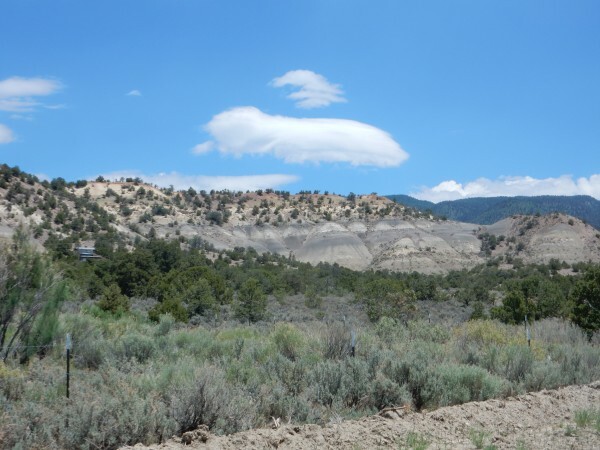 The Mancos Shale is a Cretaceous formation, laid down between 95 and 80 million years ago during the last invasion of the sea into the Jemez area. At the start of the Cretaceous, South America rifted away from Africa, and the vigorous new mid-ocean ridge displaced enough sea water to raise sea levels to the highest levels we know of in the geologic record. At the same time, vigorous subduction under the west coast of North America began another episode of mountain building, the Sevier Orogeny. The weight of the mountains thrown up in western California and eastern Nevada caused plate flexure, where the continental crust further inland was pushed down into the mantle. The flow of subducting rock downwards beneath western North America also tended to pull the crust downwards. The combined effect was to produce a deep foreland basin east of the Sierra Nevada. As the climate warmed and sea levels rose, this basin was flooded by a shallow sea, the Western Interior Seaway, in an event called the Zuni Transgression. 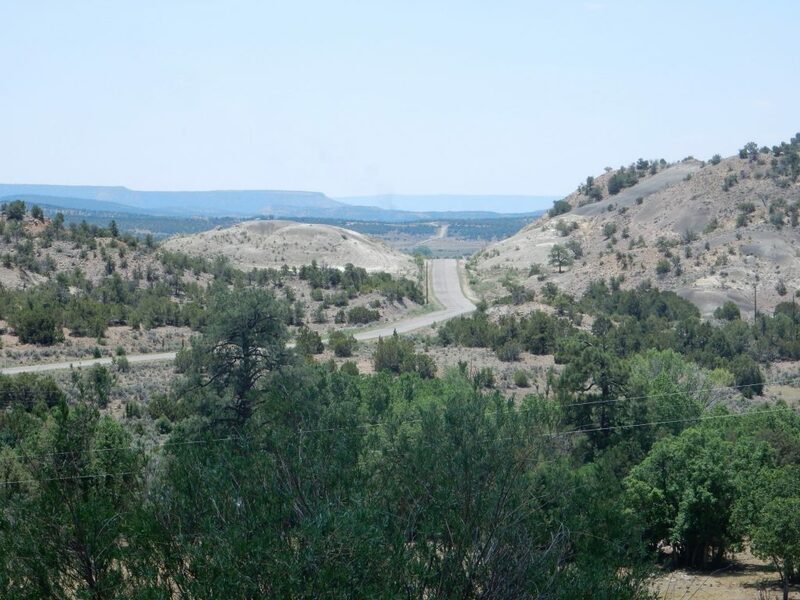 The Jemez area was thus in a coastal or shallow marine environment during the Cretaceous, and coal beds were laid down in many locations in northern New Mexico, including the Madrid area southeast of the Jemez. 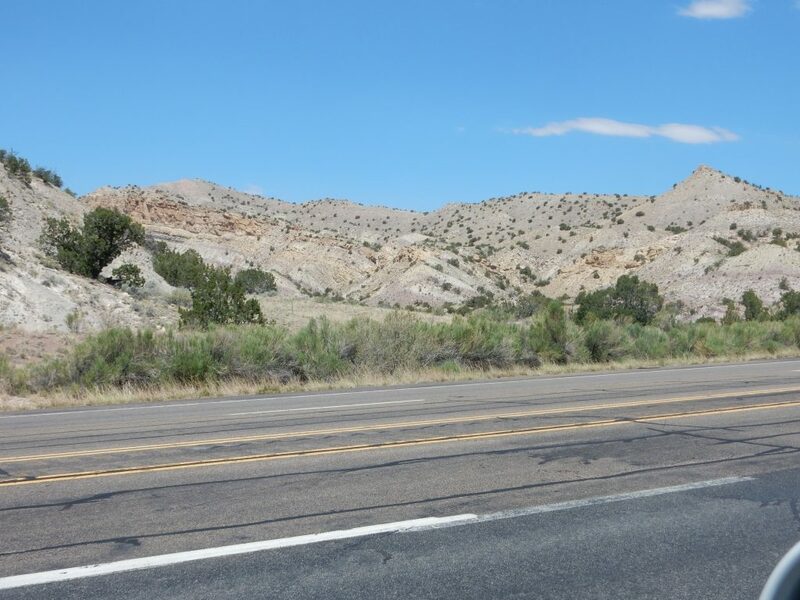 The record of oceanic transgressions and regressions is particularly complete in northwestern New Mexico, where sandstone beds in the prevalent shale shows the passage of shorelines over time. 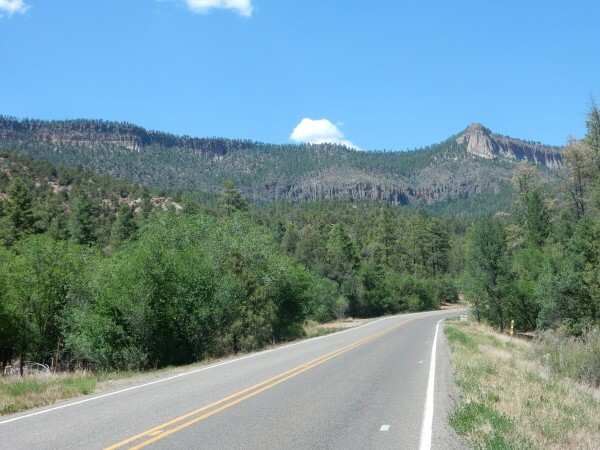 The Jemez area was above sea level at the start and end of the period, but was submerged for around 20 million years in its middle. The Western Interior Seaway is unusual in the geologic record in that ample runoff from the early Rocky Mountains to the west reduced the salinity of the water significantly. 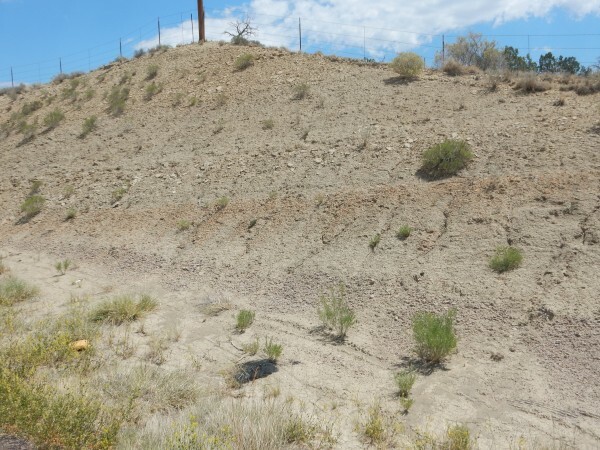 The runoff also carried considerable organic matter, which produced many black shale beds of the Cretaceous in the western United States. Sediment accumulation was rapid, as much as 195 meters per million years in some locations in southwestern Colorado. The beds shown here include a thin bed of what looks to be limestone. 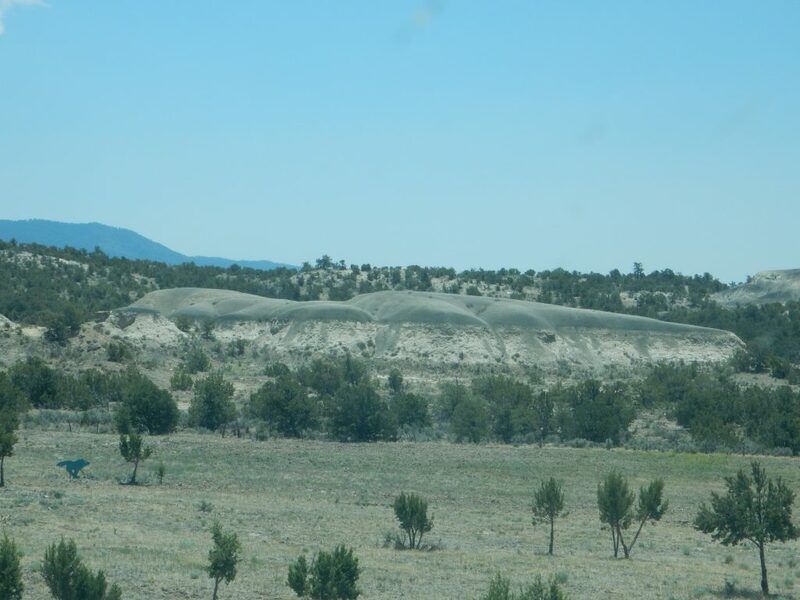 These are scattered through the Mancos Shale. Most of the rest is shale, formed from clay and other fine sediments deposited in a relatively quiet environment. 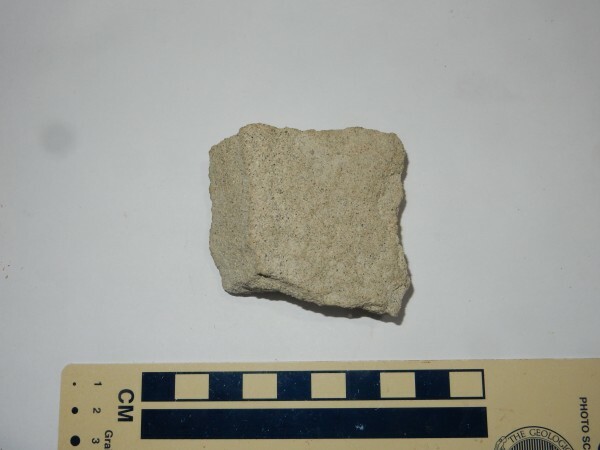 At the microscopic level, clay is a flaky mineral, somewhat resembling mica; in quiet water, the flakes settle to the bottom such that the flake lies flat. The rock produced from such ordered sedimentation is visibly very thinly layered, looking almost like baklava. 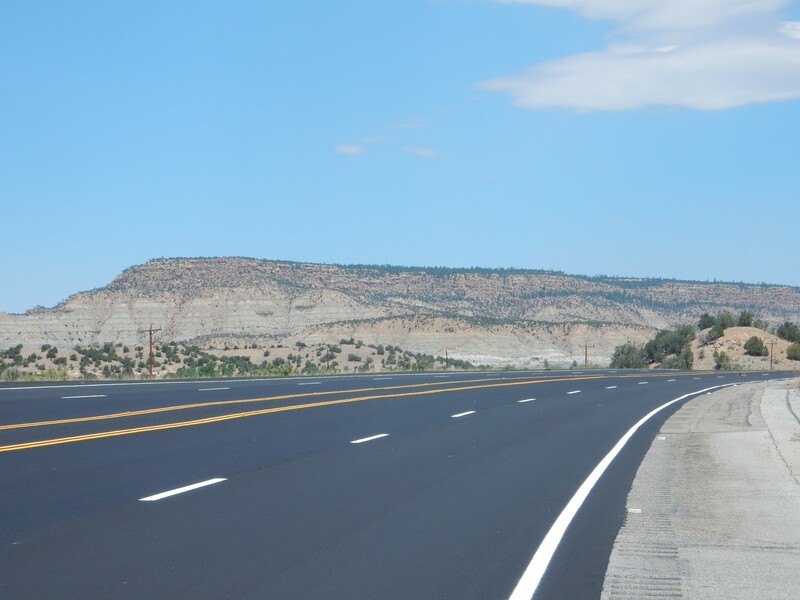 On the other side of the highway are hills of Mancos Shale. 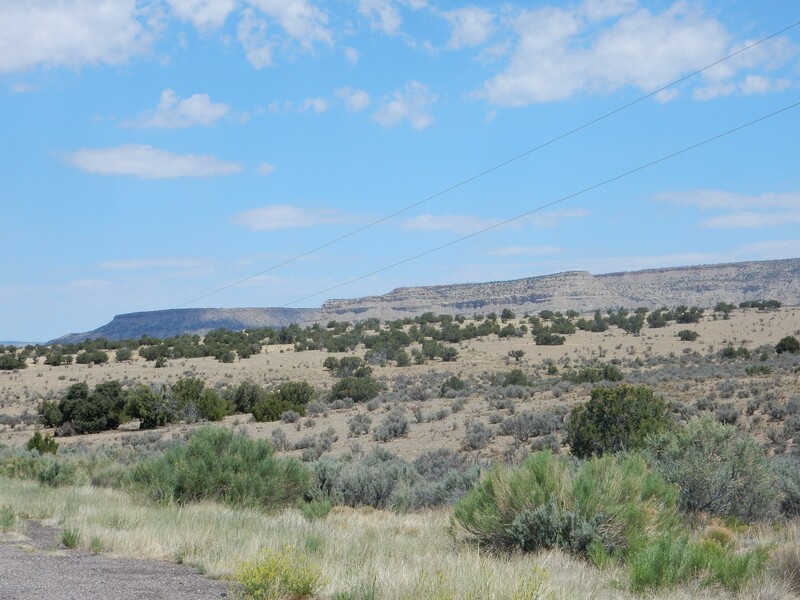 To the west, the ground slopes very gently into the San Juan Basin. 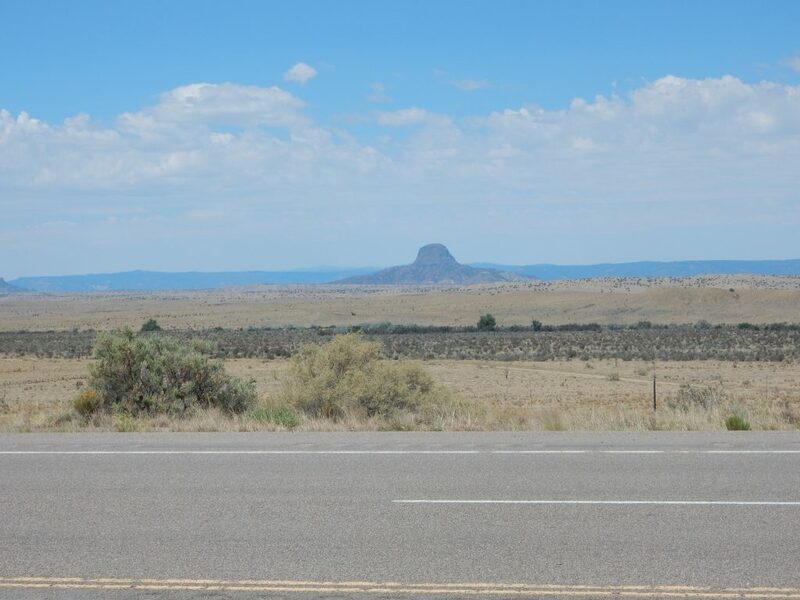 Here there are several young volcanic plugs, of which the largest is Cabezon Peak. The plugs here are around three million years old, much younger than the Mancos Shale through which they erupted. The eruptions produced cinder cones, which because they are formed of loose volcanic cinder are quickly eroded away. The liquid lava in the neck of the cinder cones hardened into more substantial rock that remains after the cone is gone. 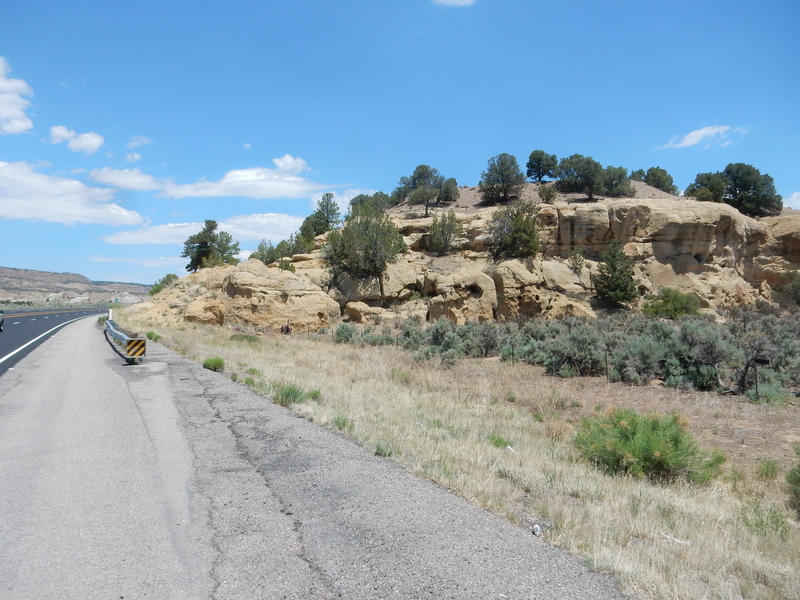 A little further on, I paused at a good road cut in the Mancos Shale. You can see some variety in the bedding. 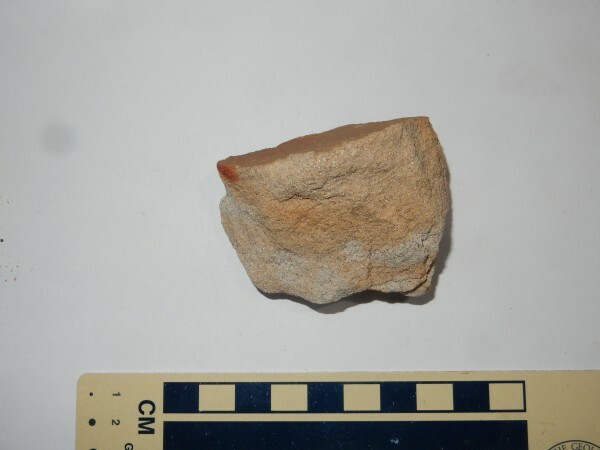 There is a layer with some reddish limestone in the middle of the photograph, and above it are two layers richer in whitish limestone. These are interbedded with shale. A little further up the road, La Ventana Mesa comes into view. 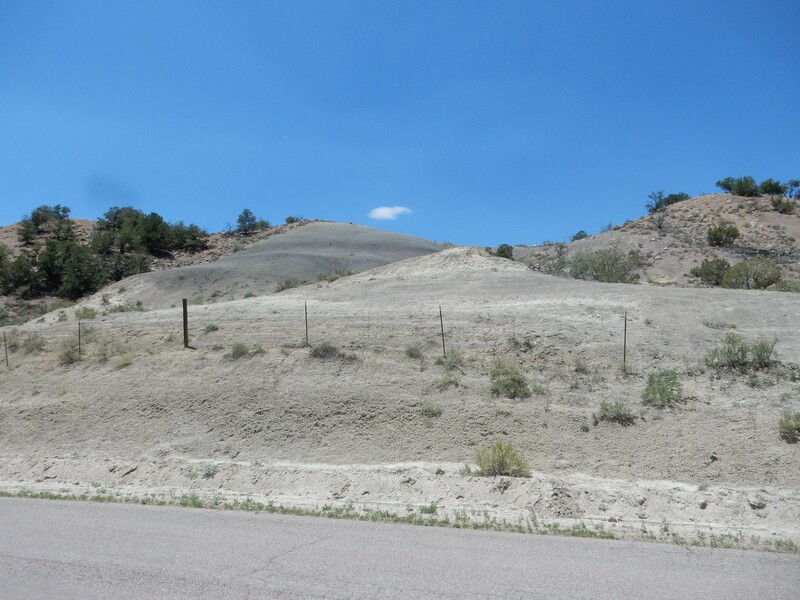 The lowermost slopes of the mesa are Mancos Shale. Then comes a thin layer of hard sandstone, the Point Lookout Sandstone. Next is another layer of relatively soft shaly sediments, the Menefee Formation, and then a cap of the Cliff House Sandstone. This is a classical regression/transgression sequence, first recognized at Mesa Verde, Colorado, from which the group gets its name: The Point Lookout Sandstone, Menefee Fromation, and Cliff House Sandstone are all formations of the Mesaverde Group. The oldest formation, the Point Lookout Sandstone, marks a regression, when the Western Interior Seaway briefly retreated to the northeast. The formation is essential beach sand. 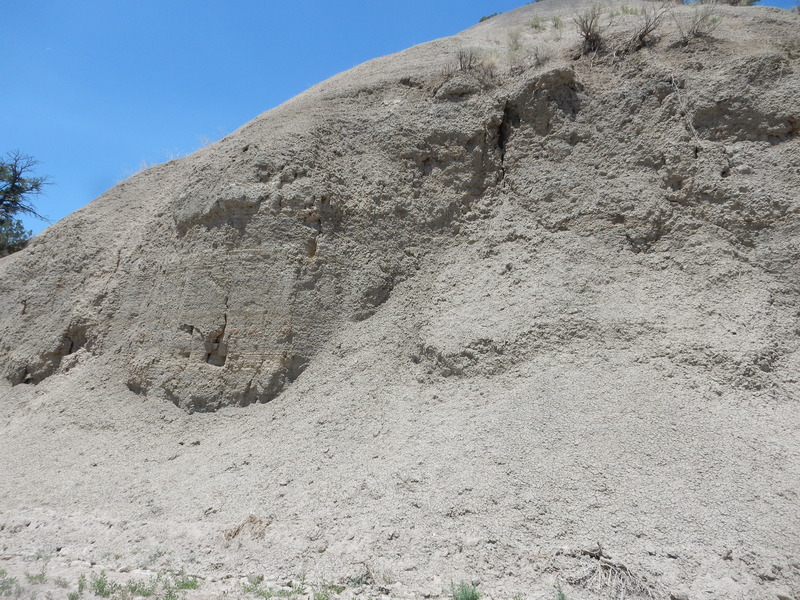 Muddy sediments continued to be deposited by rivers in swamps behind the beach, giving rise to the Menefee Formation — which is a rich source of coal, at Madrid and other locations. Coal forms in swamps where organic matter accumulates without fully decaying in the stagnant waters. The Cliff House Sandstone marks the return of the sea, laying down another sequence of beach sand. Here’s a close view of the contact between the Mancos Shale and the Point Lookout Sandstone. Where would you place the exact contact? At the top of the gentle slope, where the first vertical beds appear? At the prominent overhang just above it? A little further on the road ascends through the Point Lookout Sandstone. You can see that it’s not pure sandstone; there are some shale beds, some of which are dark enough to suggest a swamp origin. Naturally I took a sample. The sample shows a “salt and pepper” appearance typical of both the Point Lookout Sandstone and the Cliff House Sandstone. The “pepper” appears under the loupe to be lithic grains — small bits of dark volcanic rock. This suggests volcanic activity somewhere in the watershed of the rivers that drained into the Western Interior Seaway here. Next is a hill exposing a great thickness of Menefee Formation capped with Cliff House Sandstone. Large blocks of Cliff House Sandstone have tumbled down the slope. I took a sample. This sandstone is dirtier than the Point Lookout Sandstone. It is richer in the “pepper” lithic grains, and it has considerable content of feldspar grains, now weathered into clay nodules. I saw no feldspar grains in the Point Lookout Sandstone. These suggest that granitic bedrock was exposed somewhere in the watershed by this point in time — about 75 million years ago. 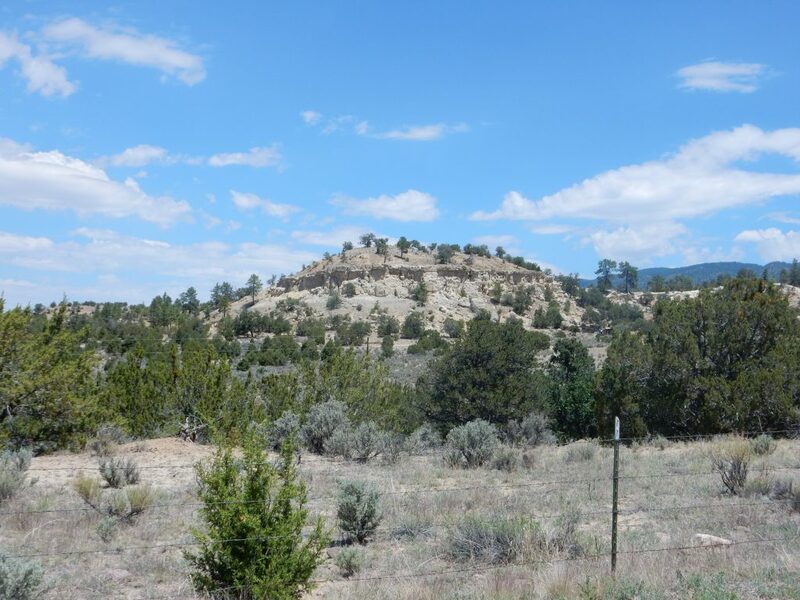 Above the Mesaverde Group is the Lewis Shale. Here, perhaps. My camera lost its GPS lock about this time, and I didn’t get it back until I was home and tinkering with the camera. 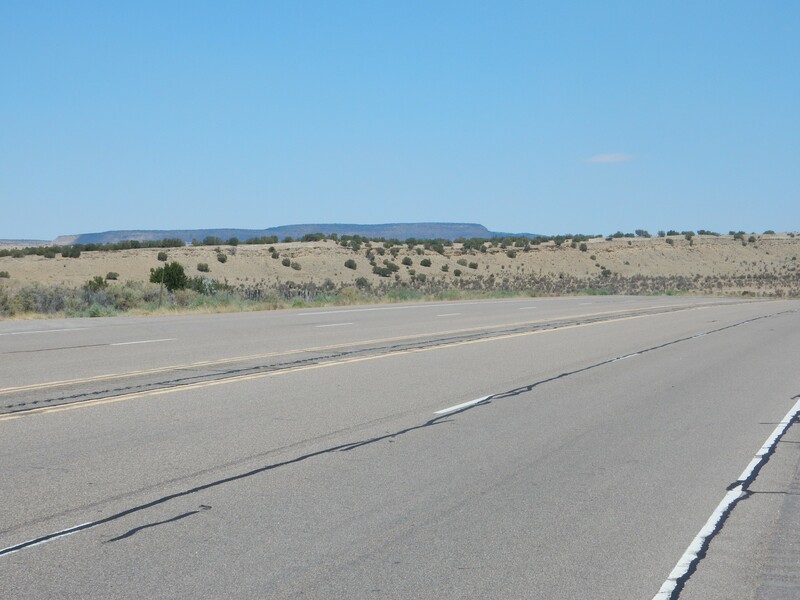 Across the highway is Mesa Portales. Here the next youngest set of Cretaceous beds are exposed. I wondered if the lowermost white slopes might be the Pictured Cliffs Sandstone, which is another formation I’m particularly interested in today. It’s a substantial cliff-forming formation in Colorado, but in this area, it does not seem to cap any mesas, suggesting it is poorly cemented here. 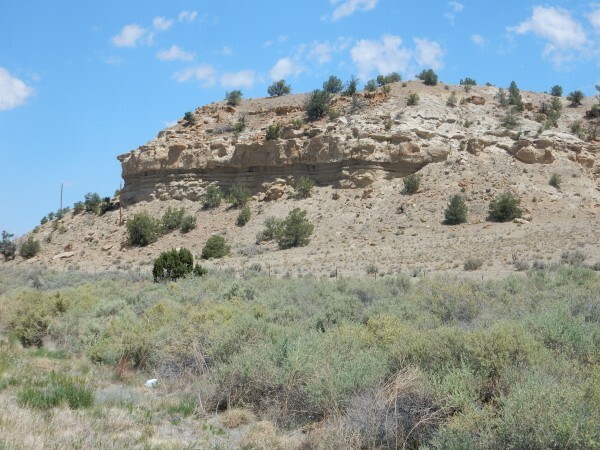 The geologic maps shows exposures of Pictured Cliffs beds at the very foot of the mesa. 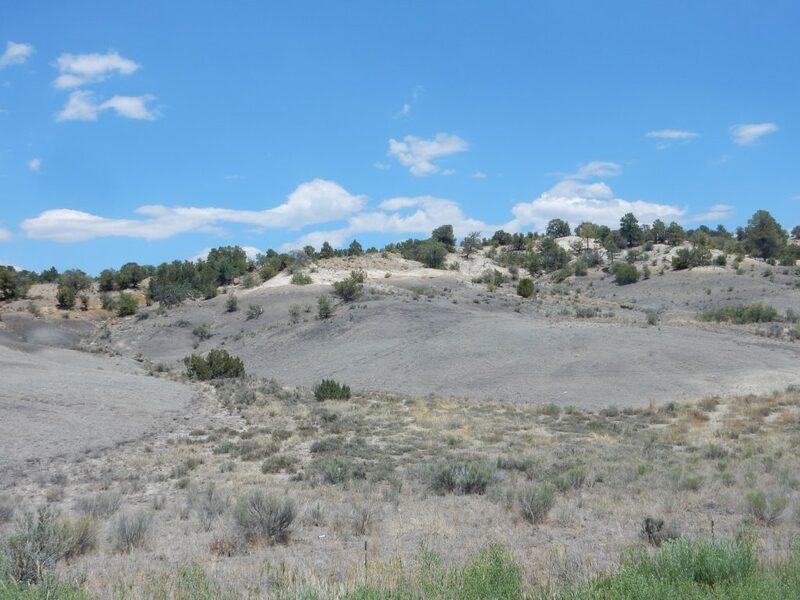 Over these are Kirtland and Fruitland Formation beds, of late Cretaceous age, which host important coal deposits further northwest in the Farmington area. 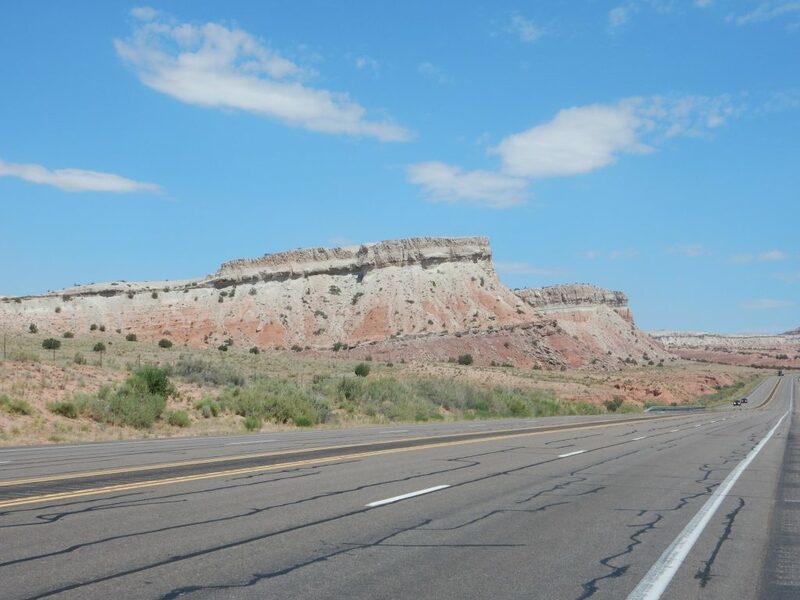 Mesa Portales is capped with Ojo Alamo Formation, a sandstone that spans the Cretaceous-Paleogene Boundary marking the end of the age of (most) dinosaurs. I still haven’t got a camera GPS lock. So I can only guess that the beds at right may be Pictured Cliffs Sandstone. Notice how very flat the Sierra Nacimiento is on the skyline. I still don’t have a GPS lock as I approach Mesa de Cuba. The lower part of the mesa are beds of the Nacimiento Formation, a Paleocene formation around 60 million years old. These beds were laid down after the sea retreated for good**, from sediments eroded off the newly-raised Rocky Mountains. The birth of the Rockies was part of an event called the Laramide orogeny, still not well understood, but likely due to an oceanic plateau colliding with western North American and subducting at a very shallow angle. The cap of the mesa is San Jose Formation, a more resistant sandstone slightly younger than the Nacimiento Formation. I wondered if the hill in the middle distance might be Kirtland-Fruitland Formations capped with Ojo Alamo sandstone, and the whtie beds at the bottom the Painted Cliffs Formation. No; looking at the geologic map, this is Nacimiento Formation capped with a very distinctive young pediment gravel found throughout the Cuba area. The gravel is described in the geologic map as a “boulder gravel”, and it mimics an old sandstone bed rather well. Ojo Alamo formation up close. GPS still not working, but almost certainly here. 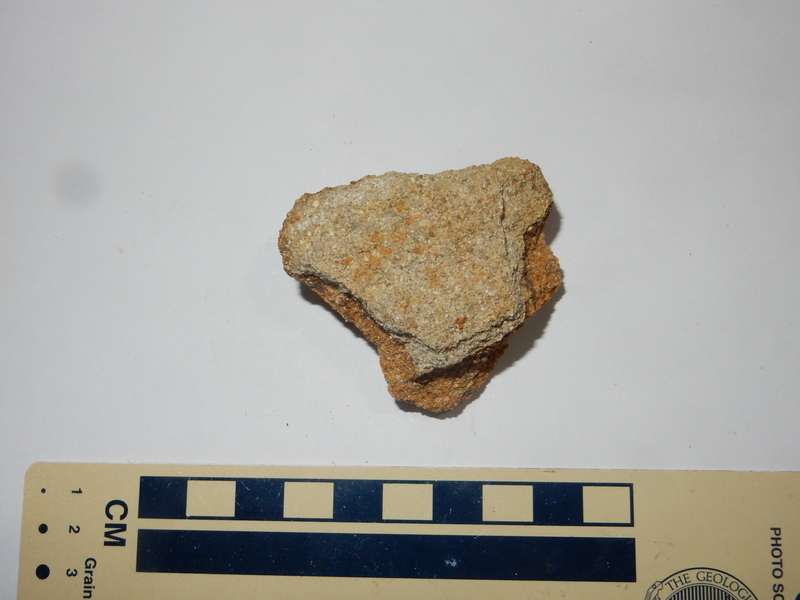 This is a fairly “dirty” sandstone, of coarse, angular grains that include a fair amount of clay particles that are likely weathered feldspar grains. 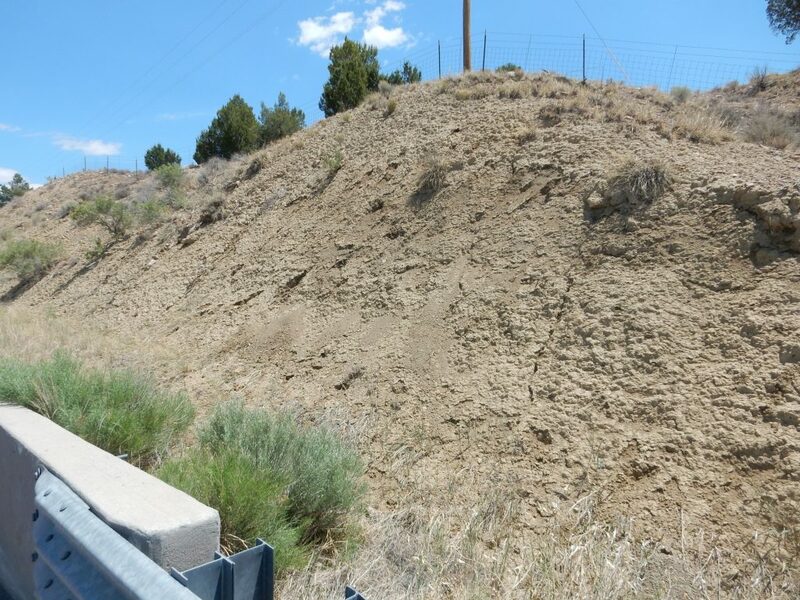 A reasonable interpretation is that this is sediments eroded off the coarse basement rock of the newly elevated Sierra Nacimiento and other Laramide uplifts. I arrived at Cuba, turned right onto SR 126 and left on 13 towards the high school, then right again on Vallecitos Road (13). I was headed for a spot where the geologic map shows the road headed right down an exposure of Pictured Cliffs Sandstone. My GPS was still not working, but from about here there is a hill to the north of Ojo Alamo Sandstone. 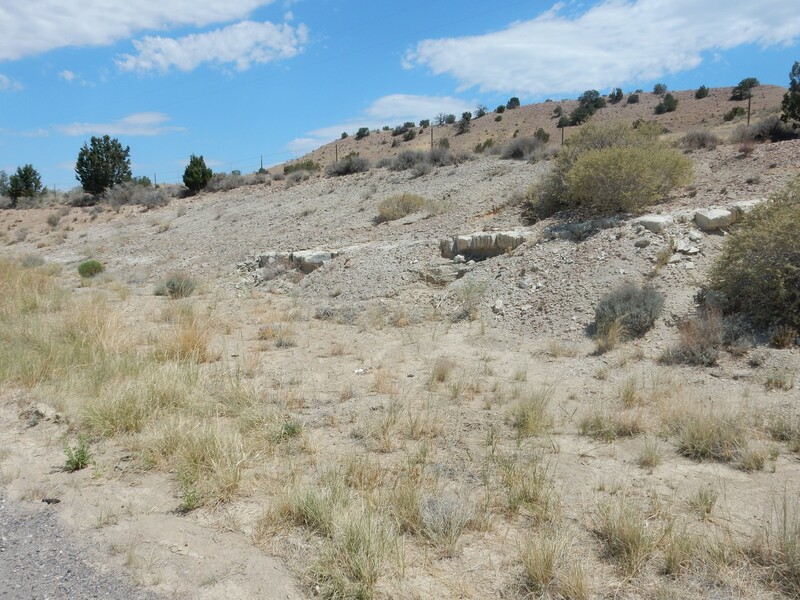 And shale, which I took for the Fruitland/Kirtland Formation, but the map has this whole area as Ojo Alamo. Unpacking Fruitland/Kirtland: These two formations are so similar in the Cuba area that they are not mapped individually. There are some exposures where I see what looks like a likely contact dividing them, but I can’t say for sure. 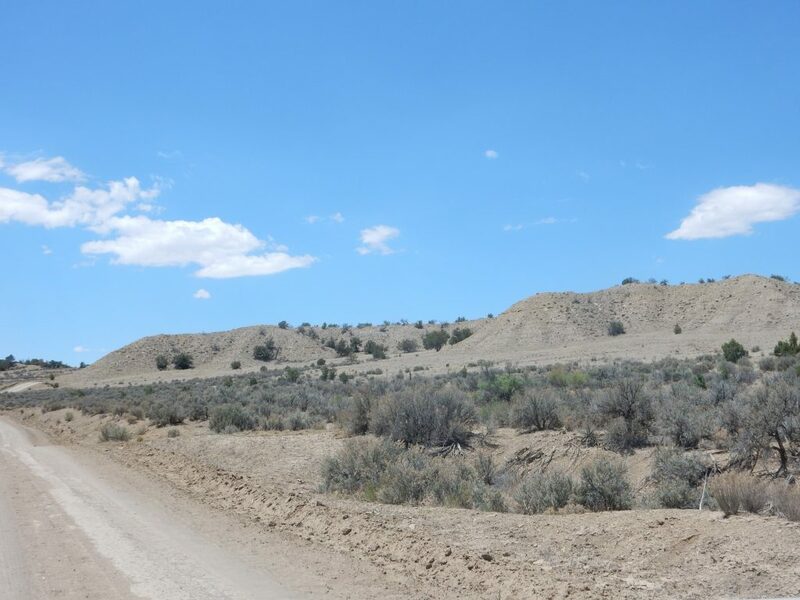 Here the contact between the Ojo Alamo and Kirtland/Fruitland is very clear. 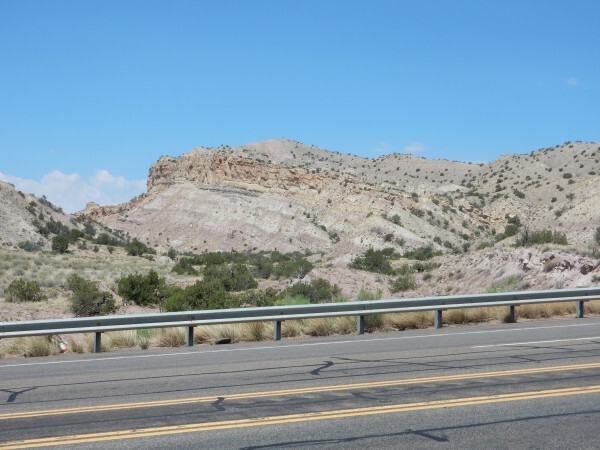 I hadn’t seen any good examples earlier, because the highway was on a flat eroded surface after it left the Lewis Shale, the formation just below the Pictured Cliffs, and no identifiable formations could be seen close to the highway until I reached the Ojo Alamo. This fills in some of that gap. Now for the remaining gap: the Pictured Cliffs. The road is supposed to turn north and run right atop an exposure of the stuff. A beautiful shale, which I was sure at the time was an exposure of the Lewis Shale. Looking at my map, the description of the local formations, and the picture here, I’m now thinking that this is part of Pictured Cliffs “Sandstone.” It’s just about where it should be, and the geologic map mentions that the Pictured Cliffs includes shales, and the color is right. 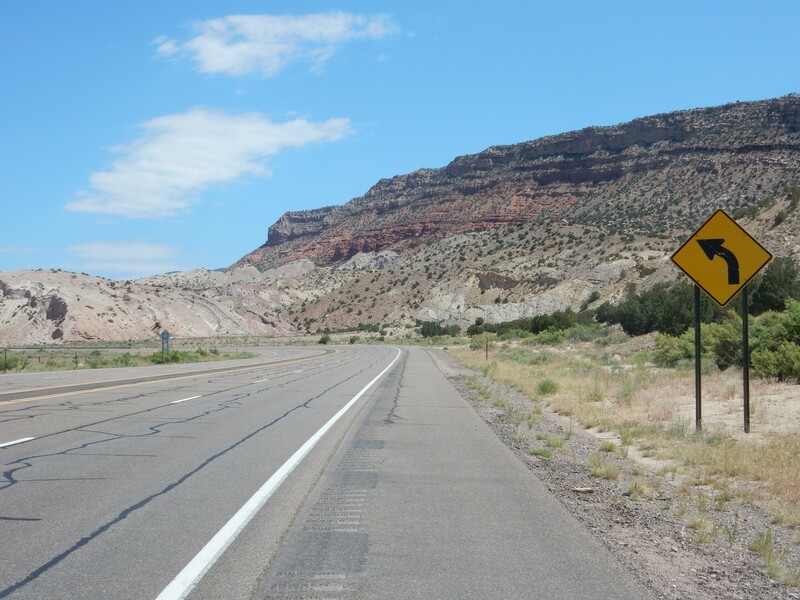 At the time, I was mightily puzzled, and a bit frustrated, that here I was driving down a road that was clearly marked on my map as crossing Pictured Cliffs Sandstone, and there was no sandstone in sight. Except atop the ridge, and a few boulders obviously eroded from the ridge top, which I identified (correctly) as Ojo Alamo. I pulled over to eat lunch, then turned around and headed on the road to see what I could see until it finally ended at private property with a wary guard dog. Turned around and headed back. Found myself looking directly down the road that was supposed to be crossing Pictured Cliffs Sandstone. Huh. 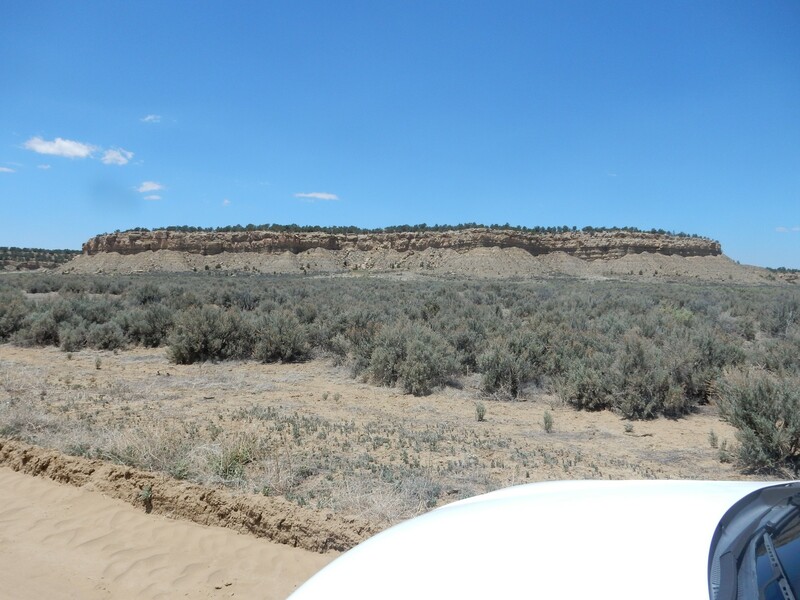 I see Lewis Shale to the left, and Kirtland/Fruitland to the right; maybe that white stuff …. ? Doesn’t fit the description very well. But it’s about the right place. Eh. I really don’t know. GPS still fritzed, but I’m pretty sure it’s here. Checking the geologic map, I find that this is all mapped as Kirtland/Fruitland. So the white beds seem not to be the Pictured Cliffs. Which the geologic map shows as cropping out to the east, here. So, yeah, I should have been looking for a dark, shaly sandstone. Which is what I think I was looking at a few photos back. The next one really frustrates me that the GPS wasn’t working. But I’m pretty sure here. Map says it’s all Kirtland/Fruitland, but there’s some Pictured Cliffs to the east. Which I drove over without noticing anything. I was getting lazy, and took this one through the car window. Map says more Kirtland-Fruitland. Just for fun, I drive as far as the Mesaverde hogback, and take another picture. (I’ve been here before). There are two noteworthy things about this. First. this exposes most of the thickness of the Cliff House and Menefee Formations in this area. Compare this with the great thickness of these formations at La Ventana Mesa. We are closer to the Sierra Nacimiento here. It seems likely that the Sierra Nacimiento was already a region of high ground in the late Cretaceous, which gives us some idea when the Laramide Orogeny started kicking in. Second, the older beds are to the right. This means the deformation associated with the Nacimiento Fault is so great that it has actually overturned the beds here. Time to start for home. Kind of on a whim, I take the dirt road west towards Mesa Portales. The road is fairly good, and it turns out to be scenic country. Cliff House Sandstone over Menefee Formation. Atop the Cliff House are rounded hills of Lewis Shale. Around here, perhaps. I’m really missing the GPS. I stop for a while to look at some of the more limy beds, but see no fossils. I then take a right; here, I think, based on my SPOT log. Somewhere around here I stop for panorama and zoom. I had a vague idea of driving to the base of the mesa, where the map shows clear exposures of Pictured Cliffs Sandstone. Wisely, I abandoned the idea; it turns out the road peters out well before you reach the mesa, and this is much too hot a day for hiking the distance. Too much with just a quart of water in my pack, anyway. There’s a better shot at reaching the mesa from here, but that’s for another trip. Why so fixated on the Pictured Cliffs? Completeness, I guess. It’s about the last formation in the Jemez area I haven’t gotten a good photograph of. Red Mesa in early afternoon. The lower slopes are Yeso Formation, giving way to lighter Glorietta Sandstone further up; the transition is gradual and hard to pick out. (How do geologists decide? Probably from fossils.) Then comes a chocolate brown layer of Moenkopi Formation, and a cap of Shinarump Conglomerate. I saw these earlier in the day. What caught my eye here was the hard bed capping the hills of Petrified Forest Formation across the flats. They lay right on a boundary between geologic maps, and there seems to be some difference of opinion; but I’ll go with the identification of these as travertine beds, limestone deposited by hot springs. There is still some hot spring activity in this area, and apparently quite a lot more in the past. A view of the southern Jemez. The familiar shape of Bodega Butte is to the right. Left of center is Pico Butte, and at far left is Chamisa Mesa. 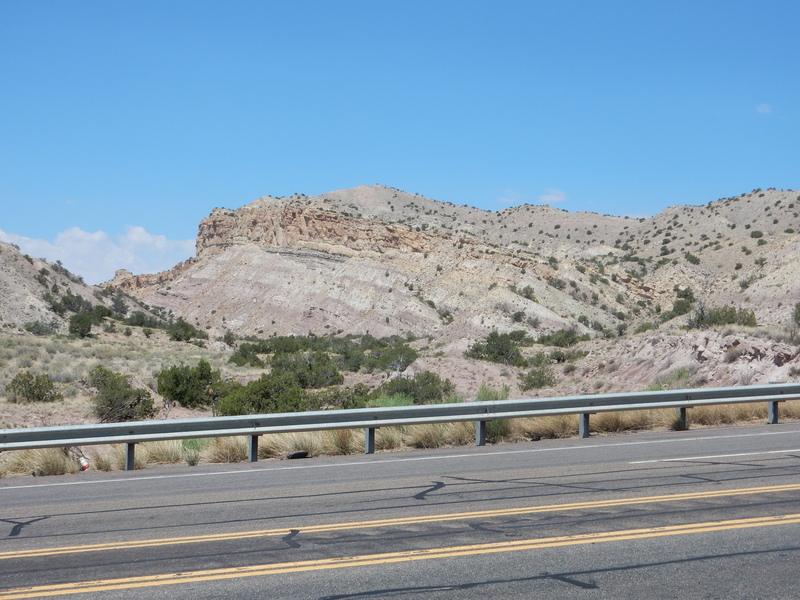 All are capped with Paliza Canyon Formation basalt over Santa Fe Group rift fill sediments. 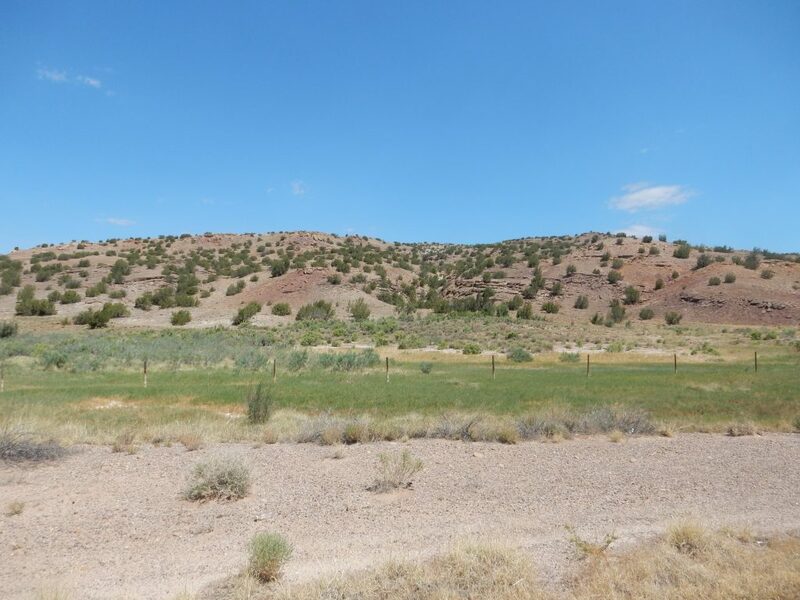 The basalt of Chamisa Mesa was long thought to be the earliest exposed volcanic rock of the Jemez volcanic field, but several older exposures are now known. Paliza Canyon Formation andesitic debris flow in upper San Diego Canyon. 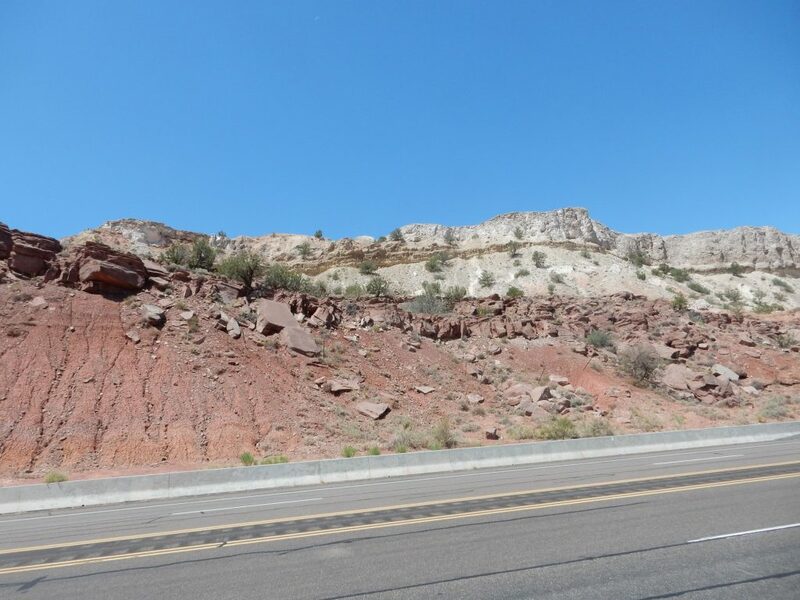 The dark rock in the cliff is andesite debris, presumably from a Paliza Canyon Formation volcano that was located north of La Cueva and foundered into the caldera when it formed. The debris flow filled a paleocanyon in the underlying Abo Formation. I already have a picture of this, but it was taken on a muddy day in bad light, and these beds deserve better. *”Super-colossal” is not hyperbole. It is the official description of an eruption of magnitude 7 on the Volcanic Explosivity Index.